The Fuzzy Five - Coming on October 4th! Yes indeedy, mark your calendars! 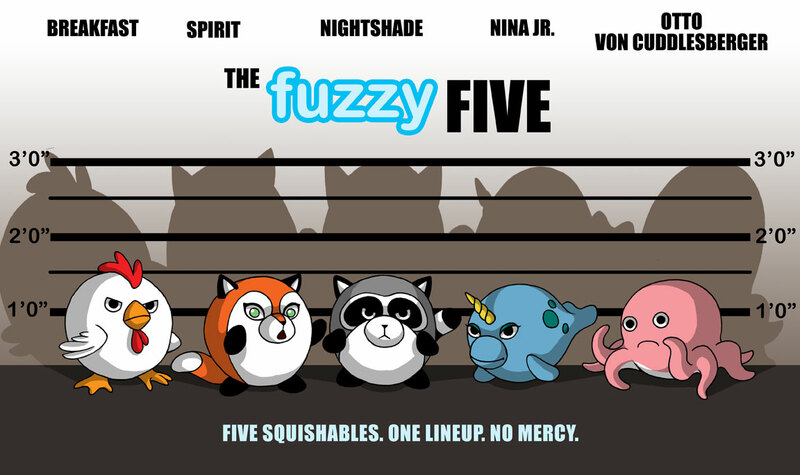 The Fuzzy Five is invading your living room, bedroom, or back pocket! Or really, wherever you do your usual comics reading. It’s going to be NIFTY! I can’t wait for the comic to come out! Yay! Where will you sell the comic at? Borders? Barnes and Noble? Super excited!! I want zombie squishable to be a new squishable!!!!!!!!!!!!!!!!!!!!!!!!!!!!!!!!!!!!!!!!!!!!!!!!!!!!!!!!!!!!!!!!!!!!!!!!!!!!!!!!!!!!!!!!!!!!!!!!!!!!!!!!!!!!!!!!!!!!!!!!!!!!!!!!!!!!!!!!!!!!!!!!!!!!!!!!!!!!!!!!!!!!!!!!!!!!!!!!!!!!!!!!!!!!!!!!!!!!!!!@#%*$! i wish they made massives like a $53.12 so i could get one for my friend or mother they should put them on sail! for mothers day say yes if they should! when r they going to make massive panda agian???? i need 1 for friend we r besties! We love squishies! Go hedgehog! Vote yes on BEAVERS!!!!!!!!!!!!!!!!! !